If your Android phone freezes or crashes on startup, or randomly restarts, you can force restart your phone in Safe mode and uninstall any of the recent app(s) that may be preventing your phone from working correctly. Now when your phone is in safe mode, you would only see the factory-installed apps on the phone but you can still go to Settings -> Apps to uninstall any apps that you have recently downloaded that might be causing problem.If your Android phone has become slow over time – because of all the installed apps, themes and widgets – you can use the safe mode to temporarily turn the tortoise into the hare without having to do a factory reset.The phone becomes insanely fast in safe mode and you can still use all the Google apps including Gmail, Chrome, Maps, Calendar and so on. The device feels more responsive too. 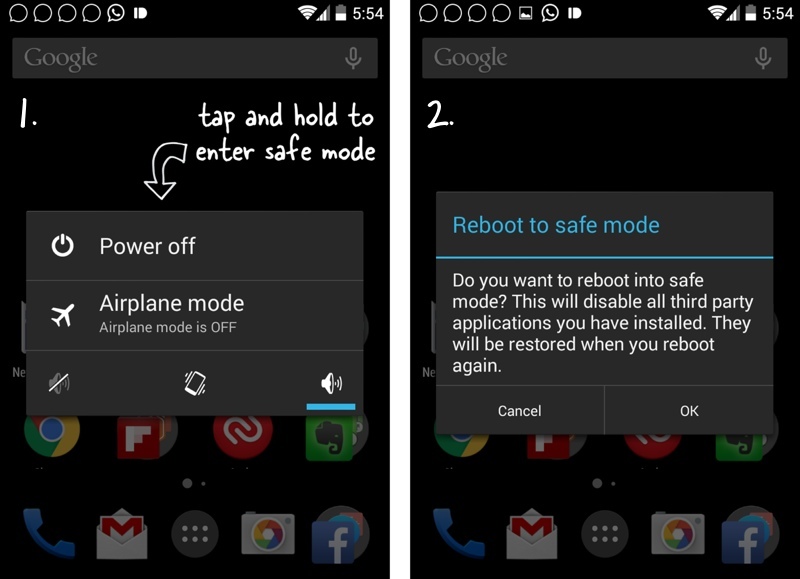 To exit the safe mode, restart your device by holding the power button, then power off and restart. The device will open in the normal mode automatically. All your apps and screens are preserved but the one big downside with Safe mode is that will log you out of all the non-Google apps. So if you have Android apps like Dropbox, Twitter or Facebook on your phone, you’ll have to login again in all these apps. Let me know if it works for you and do not hesitate to leave a comment below.